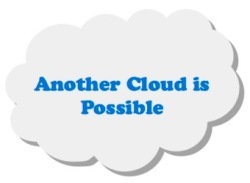 Are you considering using the Cloud at your nonprofit organization? What are some implications of the use of the Cloud for nonprofits and social justice movements? The Cloud is sold as a nicely packaged solution to store your data in one secure place. The reality of our current Cloud use is different. Really, the Cloud is a densely fragmented patchwork of services, models, and tools that you use online to store, edit, and share information. As technology users and consumers, and as social justice workers, we like to think about how storing and sharing information online may effect our organization or the people we serve. We’ve put together a few thoughts over time. The following list is by no means all inclusive but hopefully presented as a path to start conversations. We are inspired to collaborate with you around the awareness of shared responsibility as activists using Cloud technologies. Technology relationships do not last forever. Technology changes. every. day. When selecting technology, think in terms of future seperations. Can we get our data out? Is our data really our data, or did we give it over to someone else? Who else can see our data on this technology? Most cloud providers hold too many cards. They are uniquely leveraged in how much data they have and what they can do with it. Better checks and balances systems need to be put in place. Putting organizations files, contacts, and data in the cloud raises rather than lowers the stakes on protecting it. If it really matters, keep-up-to-date versions locally, along with Plan B. The idea of the cloud is still young. Don’t trailblaze or make big bets if you don’t have too. Rather, model on others’ success. Time will tell and teach. Nonprofit Brainstorm: What’s in Your Cloud? Where do you have accounts online? Where do you put files online or contact information? What internet services are you using to house your data? When you start by taking an inventory of where you are at, you can get a real sense of where you stand rather than getting paranoid (or nihilistic) about your cloud use ;). 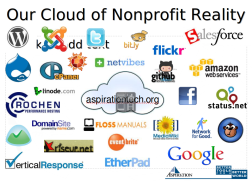 Thank you to Gunner for sharing his tips on the Cloud through many nonprofit technology trainings and inspiring the blog post. Thank you to Jessica Steimer for helping to get our data house in order. What are other things to consider before putting your data in the cloud?